Managing Ethics brings managers and supervisors into the same situations from our introductory video, Workplace Ethics, and supplements their ethics training with ethical leadership skills necessary for maintaining an ethical workplace. The benefits of working in an ethical company are well known. This managing ethics training video will help your managers and supervisors develop an ethical leadership perspective in order to sustain a culture of integrity among all employees. Managing Ethics replays the scenarios portrayed in its companion training video, Workplace Ethics, but this time from the leader’s point of view, illustrating essential management skills. Your managers and supervisors will learn how to share core values in ways that employees can personally understand, live the values themselves every day, and take appropriate action—by acknowledging positive behavior or promptly correcting ethical lapses. Ethics shouldn’t be taken for granted. Without constant attention, ethical standards can be weakened by small decisions that add up. 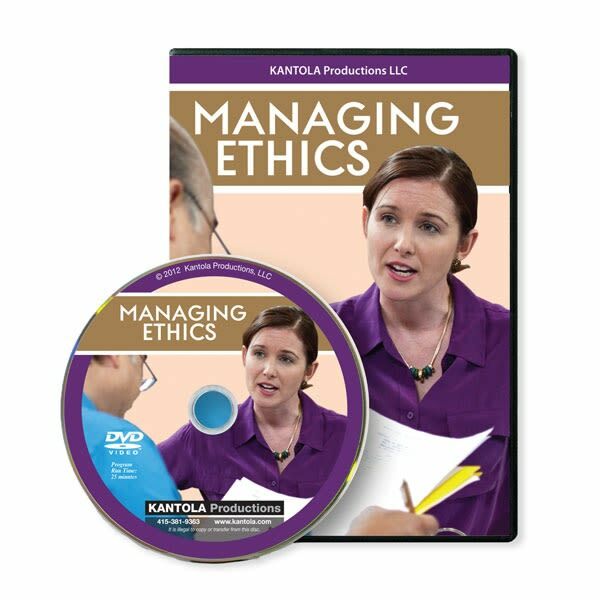 This ethics training DVD gives your managers the tools they need to uphold standards and protect the integrity of your organization.